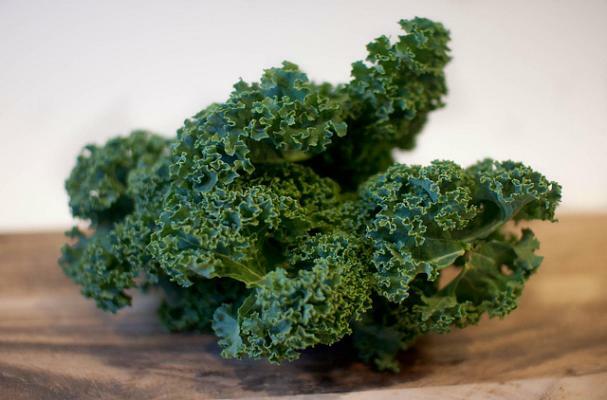 Kale is definitly a super food, but is by no means a super hip food. While it is known for its nutritional properties -- an excellent source of iron, vitamin B6 and folate/folic acid, magnesium and vitamin C -- it's usually ranked right up there with collard greens as a "thanks, but no thanks" on the dinner table. Dark leafy greens are one of the healthiest groups of veggies to have in your diet on a regular basis, and while kale is widely associated with "health food", it's a seriously delicious green! Perfect for soups, salads, or turning into healthy chips, kale is a plentiful autumn and winter green that should absolutely find a way into your diet. Here are 5 of my favorite kale recipes, all gluten free and dairy free, to change your mind! A super versatile recipe using two of autumns finest (and healthiest!) veggies, just be sure to use gluten free tortillas when you make your quesadillas! Vegan/Dairy free option. This super simple salad will make you fall in love with fresh kale all over again. Creamy avocados, salty black olives and crisp cucumbers add a whole new dimension to this delectable salad. Raw and vegan. Not raw? Feel free to use toasted hazelnuts or pine nuts or pumpkin seeds! Yum! Spicy marinated chicken is seared and served atop wilted kale and warm tomatoes - a perfect dish to transition from warmer to cooler weather! White Bean, Kale and Sausage Soup - Crockpot/Slow Cooker recipe! A twist on a classic Italian white bean soup, this delicious version can be made with your choice of (GF) sausage and seriously cannot be any easier! Served over millet or quinoa, this tasty salad is all about umami -- toasted sesame oil, salty tamari, and nutty toasted coconut are a foodie force to be reckoned with. Hi Kelsey, thanks for the link! All of those recipes look fantastic.